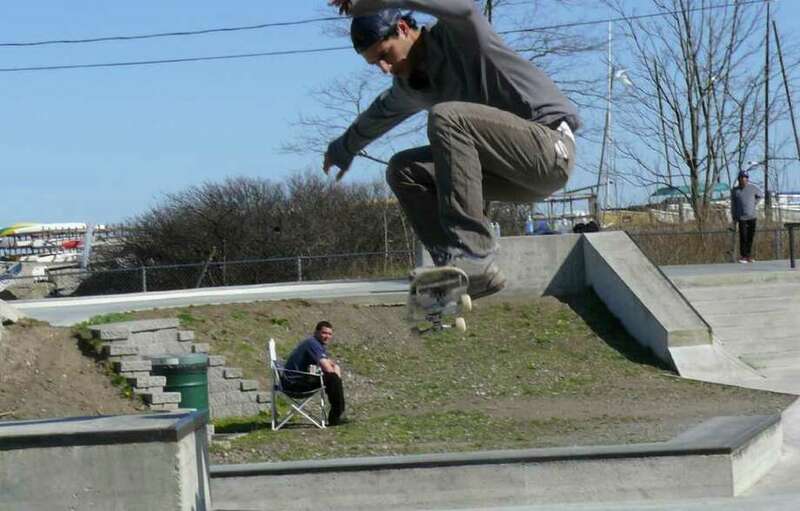 The Parks and Recreation Commission has hired a monitor for the skate park at the marina. The skate park is only open when a supervisor is present. After a recent temporary shutdown, the Parks and Recreation Commission on Thursday voted to re-open the skate park at South Benson Marina -- but only when a supervisor is on site. The commission is also leaning toward requiring skate park users to purchase a season pass, which could be revoked for those who violate the rules. The panel closed the park recently after an altercation between an off-duty Trumbull police officer and a group of teen-age skaters. The Police Department is still investigating the incident. Recreation Director Gerald Lombardo said the new hours for the park are posted and a monitor has been hired. He estimated the monitoring will cost about $20,000 a year, which will be taken out of the department's revolving fund. While commissioners said charging a fee for a season pass would help to defray the cost of the park monitor, they said the main reason is to hold skaters accountable for their actions. "I'm not so worried about offsetting the cost," Barbara Rifkin said, but if the skaters have to come with their parents to the Recreation Center to pick up a pass that has been revoked, it could go a long way in getting skaters to abide by the rules. "That's the key," agreed Jack Tetreau. The commissioners are looking at a "three-strikes" policy for violaters of the skate park rules. With the first violation, for example, the pass -- which would have the skater's photo on it -- would be revoked for a week. On the second violation, skate park privileges would be lost for two weeks. A third violation would mean the ID would be confiscated for the season. Lombardo said he wants to keep the park open. "I see both sides of it," he said, but added that many of the skater who use the park, while sometimes disrespectful to authority, are polite to each other, often looking out for younger skaters. Board Chairman Ellery Plotkin said there have been reports of mothers with young children using the park who say they sometimes feel intimidated or threatened by the older skaters if they say anything when they skate too close to children using scooters. Lombardo said those mothers who bring younger children with scooters are actually breaking the rules, which are posted in several places at the skate park. Scooters and bicycles are not allowed at the park. The commissioners will hammer out the details of requiring passes and setting the fees for the skate park at their meeting in April. Tetreau said that, in addition to obtaining a pass, skaters and their parents should be required to sign a waiver of liability as well as a code of conduct. The skate park is now open during the school year from 3 to 6 p.m. Monday through Friday and from 10 a.m. to 6 p.m. weekends. On school holidays and early-dismissal days, the park is open from 10 a.m. to 6 p.m and during the summer vacation, the park will be open frm 10 a.m. to 7 p.m. Anyone caught inside the park when it is closed faces arrest for trespassing.